In today's job market, knowing how to use keywords effectively is a crucial part of landing your dream job. No matter how experienced you are, if your resume can't make it past the scanning software used to screen applicants, you'll never get a chance to dazzle the hiring manager in person. Using keywords in your resume is a worthwhile endeavor. It'll help both automated and human screeners understand what you have to offer. Let's take a closer look. ATS (Applicant Tracking System) software evaluates resumes based on specific keywords that an employer is looking for. The software then presents the hiring manager with a ranked list of candidates based on who has the most keywords in their resume. The candidates at the top of the list are the ones most often called in for an interview. ATS software serves several important purposes. It helps to eliminate candidates with irrelevant experience, saves hiring managers the hassle of reviewing hundreds of resumes for one opening. The software can also prevent accusations of bias in the hiring process. As you're writing your resume, you can increase your chances of being granted an interview by including keywords throughout the document. You can include keywords in your professional summary, core competencies, work experience, and education sections. Each word only needs to be used once to be effective, so there's no need to force unnecessary repetition. 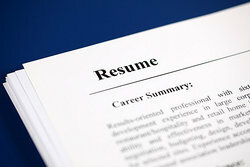 Unfortunately, there is no single set of keywords you can use to ensure that your resume passes an ATS screening. Keywords are targeted to specific industries, specific roles and positions, and the specific needs of a particular company. To search for keywords that are appropriate for your job search, find four to six job postings of interest and highlight any words or phrases that appear in multiple listings. You can get a good idea of what keywords to include by looking for relevant terms in four different areas: technical skills, soft skills, communication skills, and certifications and licenses. When listing technical skills on your resume, keep in mind that you should have a solid working knowledge of any specific program you're included. Don't include anything that you've only used once or twice. Including Microsoft Word and Microsoft Office on your resume is unnecessary unless you're applying for an entry-level clerical job where this is specifically listed in the job description. For more experienced workers, proficiency is assumed. Highlighting soft skills on your resume is always a good idea, but is particularly important when you're a recent graduate, returning to the workforce after an extended absence, or trying to switch career fields. Using soft skills keywords as you describe your experience helps highlight transferable skills to your potential employer. Here's more on the Best Skills to List on a Resume. An ability to express your ideas and function on a team is important to a broad range of roles. So, if any of these communication skills line up with your experience, you might want to consider them. And, certainly, if you're applying for a job that mentions communication skills in the job description, some of these keywords might be beneficial. Of course, each job application and resume will have to be tailor-made for your industry. But, let's take a look at a sampling of industry-specific keywords. Perhaps a few of them will be appropriate for your resume. When listing certifications and licenses on your resume, include the expiration date if applicable. You'll know that you've chosen appropriate keywords for your resume when you start seeing an increase in interview requests. If you find yourself going several weeks without any positive feedback, it may be time to revisit your keyword choices. You might want to consider mixing in some appropriate action words too. Remember, your resume isn't set in stone. Feel free to keep making adjustments as the need arises. And, when the big day arrives, here are some Smart Questions to Ask in an Interview. "Using Keywords in Your Resume." YourDictionary, n.d. Web. 19 April 2019. <https://examples.yourdictionary.com/using-keywords-in-your-resume.html>. In today's job market, knowing how to use keywords effectively is a crucial part of landing your dream job. No matter how experienced you are, if your resume can't make it past the scanning software used to screen applicants, you'll never get a chance to dazzle the hiring manager in person. Using keywords in your resume is a worthwhile endeavor. It’ll help both automated and human screeners understand what you have to offer. Let’s take a closer look.